A GREAT STOPPING POINT JUST A SKIP OFF OF 69 HWY COMING INTO MCALESTER OKLAHOMA. Reservations must be cancelled before 2PM on the day of arrival or first night will be charged. Reservations made after 2PM on same day arrival cannot be cancelled. Reservations require a valid credit card. We offer pull through and Back-in sites and can accommodate some of the biggest rigs on the road. Major new improvements to the park with new drainage, new power boxes, plumbing improvements and releveling are some of the things we've done to enhance your stay with us. We offer a laundry, wash house, vending machines and free wifi. All sites are full hook ups. 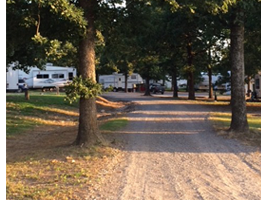 Pets are welcome but must be kept on a leash while outside your RV. Our park is quiet, peaceful, and safe. PLEASE COME AND VISIT AND ENJOY A NICE STOP ON YOUR WAY THROUGH OUR GREAT STATE! All Campground payments are in advance. Prices will be good for 30 or 50 amp campers. Price includes all utilities, full hookups, bathhouse use, and wifi. $100.00 nonrefundable deposit may be required on long term stay reservations. Storage - $5.00 per day or $45.00 per month.